Storytelling + Research = LoiS: Don't Walk the Plank! Guess I should walk the plank for not catching something. Looked at last month's blog, Are Ballads Really Storytelling?, and found my opening picture had vanished! Tried to use my Summer Reading postcard design from my Vistaprint folder, but that design stopped appearing where I inserted it. Murphy's Law is still in force, even for pirates. My puppy puppet, Buzz, turns pirate for the summer of 2013 as we "Dig for Treasure in the 398s" and he misses the pawprints appearing all over the card design. Guess it's time to get my own paws digging for some of that treasure. There's always a wealth of resources at any library, both in books and online. I'm just beginning to think about what I want to tell. My first choice: tales of treasure, especially if pirates are part of the story. Last month looked at Ballads as Storytelling and I have decided the song "High Barbaree" is a must. 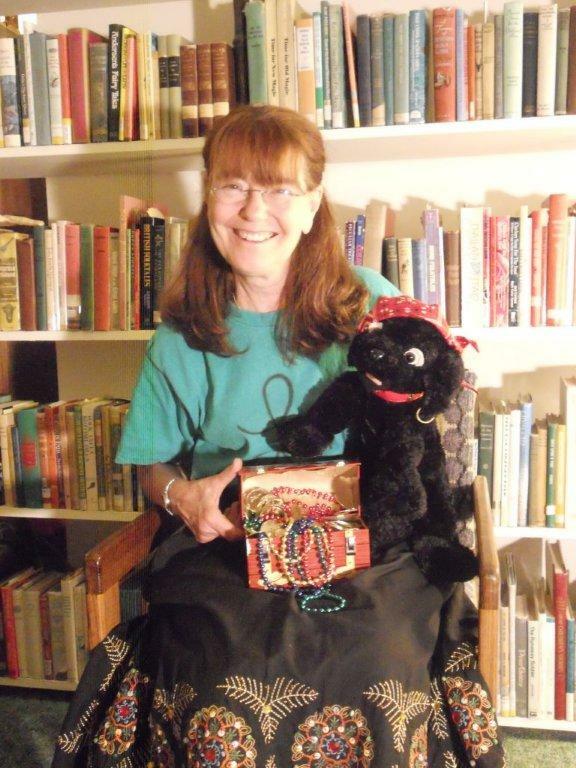 A recent comment on the state email list for librarians, MICHLIB-L, included a request for material to use with a pirate puppet. This post includes resources for that and much more. For the youngest lovers of anything Pirate-related, I've fallen in love with a new (to me!) resource, Storytime Katie, which is subtitled "one librarian's journey into storytimeland." More years ago than I'm willing to admit I tried documenting my themes and material used, but like a diary, eventually stopped writing it. (I justified it with the idea that not only do materials come and go, but it also may produce some fresh thinking.) Thanks to blogging, Katie gives us both her own and readers resources for: crafts, flannelboards, fingerplays, songs, and THEMES, including, yes, indeed, Pirates. She's also one-stop linking for early childhood resources, so go to both her Resources page and also her Blogroll. So far it's 3 years of work -- the very reason I stopped recording back in pre-computer days, so let's hear it for Better Storytelling Through Technology! Moving on beyond early childhood material is sometimes more difficult, but not if you know my friend and colleague out in Massachusetts, Karen Chace. She has a website, Catch the Story Bug, and a blog, packed to overflowing with treasure of all kinds and, like me, she works with all ages. Her recent Talk Like a Pirate Day blog article is great to find pirate stories, music, crafts, and even curriculum material from the New England Pirate Museum, plus such miscellaneous material for some of those jokes I plan to inflict, er share with my audiences. last of all, but definitely not the least is Enchanted Learning.com where you can go from their definitely kid-friendly jokes to their PirateTheme page for crafts and worksheets, many of which would make great handouts for preschool to about grade 3. In a bowl mix a few drops of food coloring into baking soda. To make RAINBOW rocks, mix each color separately Slowly add water to the bowl, mixing in-between. It is easy to add to much water so you definitely want to add it slowly. Add enough baking soda to mold it and holds it's shape. Too much water will keep the baking soda from molding. Inside each "rock" you can hide a small treasure inside. Then lay your baking soda rocks out to dry. Once dry you can bury them in dirt or a sandbox and let children find them. 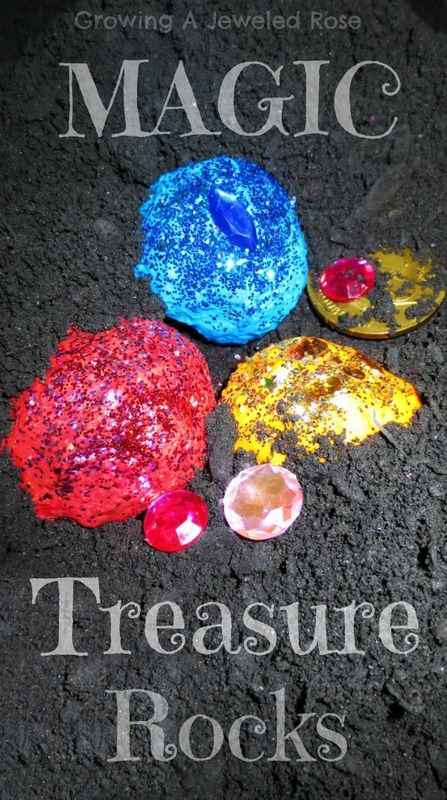 For added fun, once they are found, spray them with vinegar and the rocks fizz and disappear, leaving the treasure!